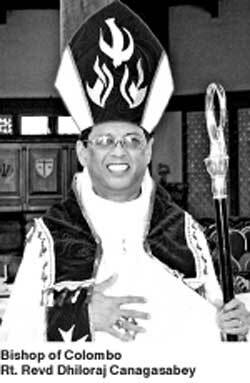 Issuing a special Independence Day message, Bishop of Colombo Rt. Revd Dhiloraj Canagasabey drew attention to the proposed code of conduct for Parliamentarians and the dangers of narcotics. Tomorrow, Sri Lanka celebrates the 70th Anniversary of her independence from the British, with pomp and pageant. Military parades, religious ceremonies, cultural festivities, stirring speeches and other self-congratulatory events will be held. I thought it fit at this time to share this reflection with my fellow country women and men because I have been much troubled by the emerging signs of aimless drift in the governance of this nation that have appeared in the past few months. It is the sacred duty of all of us who love this country deeply to give heed to these warning signs, to call attention to the chaotic and open contradictions that are visible with each passing day, if we are not to stumble onto another disastrous period in the life of our nation. To be sure, part of this anarchic situation is due to the ongoing local government election campaign and the jockeying by different parties to obtain maximum political benefit for themselves, further exacerbated by the uneasy alliance of the two main political rivals in the grand coalition. But herein lies one of the fatal weaknesses of our short-sightedness where important national interests are made subordinate to short term political advantages. Two recent events have sparked my decision to write this letter. The first, the utterly shameful and revolting conduct of our legislators, including senior members of both the government and the opposition (those who due to their seniority, their long experience and their backgrounds should have known to exercise restraint), during the emergency session of Parliament to debate the report by the Commission of Inquiry into the issuance of Treasury Bonds on 10th January. It is no excuse to say that these kinds of incidents happen in legislatures all over the world. They are happening all too frequently in our own. A ‘Code of Conduct’ for parliamentarians was a promise held out by the President during the Election campaign of 2015. As with several other promises, this too is still pending. To exercise, perform and discharge their powers, functions and duties of public office and also to enjoy the privileges which they are entitled to under any law diligently, with civility, dignity, due care and honour. Every Member shall be individually responsible to contribute to the effective and efficient functioning of the Parliament. Every Member shall respect the roles, independence, rights and responsibilities of the Parliamentary Staff. Every Member shall in upholding the Parliamentary Democracy be responsible to ensure that the Executive Government is accountable to Parliament. The Members shall not undertake any activity which may cause damage to the reputation and integrity of the Parliament or of its Members or the country. By any interpretation, our parliamentarians who have been elected by the people to serve them, paid by tax payers’ money, who enjoy many benefits that they have voted for themselves, have miserably failed to live up to any of these noble concepts. The second matter I wish to talk about relates to the visible lack of authority, coherence and unity in the government. The majority of people in this country appreciate and value the democratic freedoms and the space that has been opened up since 2015 and understand the reluctance of the administration to resort to heavy handedness. People are also aware of the strains and tensions of running a government in these circumstances. A government however is elected to govern, and not to present a picture of indecision, constant bickering and paralysis to the nation. This lack of consistency and the pulling in different directions by the leadership of the nation breeds uncertainty, and impacts harmfully on state administration as well as on overall national confidence. Finally, I want to touch on the huge menace of narcotics and substance abuse in this country. In my visits to our parishes in many areas of the country, it is very, very common to hear about the easy availability of various types of drugs and of their use by many young people in our country. Not only are their lives being ruined by their addiction, but there is also damage to their families and to communities as well as to society at large due to resultant criminal activity. Recently we saw and read about a vast quantity of seized narcotics being publicly destroyed in the presence of the President and the Prime Minister. We also frequently read about small time smugglers or dealers who been detected, arrested and fined or imprisoned. But rarely do we hear about the arrest or prosecution of major figures behind the import of narcotics into the country. I wonder why this is so ? During the last election campaign we heard much about drug dealers and politicians who were backing them and about how action would be taken against such persons. Surely it is not the small time smuggler or the dealer who are behind the huge networks that finance and supply narcotics to the market and who while enriching themselves massively and illegally also callously bring ruin and destruction to the youth of our nation. I call on our leaders and the government to take serious stock of the situation of the nation as we approach the beginning of the 7th decade of our independence, to put aside their arrogant, selfish and foolish behaviour, to remember the promises they made to the people 3 years ago for an honest corruption free administration dedicated to putting the interest of the people of this county, especially the weak, the powerless and the voiceless foremost, to be true and faithful to the teachings of their own religions.